I think most bloggers can relate when I say that I absolutely did not go into blogging with the intention of getting free clothes, but there has, of course, always been that hope in the back of my mind. Can you blame me? Somehow, by some holy power, I was contacted by eShakti last week who asked if I'd like to review one of their products. It only took a full 10 seconds of looking at the website to become impressed and reply with a resounding "YES." And let me tell you, impressed is an understatement. Click through for my full review. I've always known that if I ever had the opportunity to review a product, I would only do it if a.) it was from a company I actually liked and trusted and b.) I would write a completely honestly review. With that, I can say, without a doubt, that I'm honestly in love with this dress. I had a hard time deciding on a dress because I really liked so many of them, but I kept going back to this one. I loved the cut of it and I thought the top was really interesting and something a bit different for me. Something that's especially wonderful about eShakti is that the company does custom sizing. Though I had the opportunity to do so, I decided to pass on custom fit (mostly do to laziness with measuring myself) and instead only went for the custom length. Being so short at 5'2", I was able to put in my height and choose for the dress to go above my knees. While I didn't take advantage of the other custom options, eShakti also offers the option to change sleeve lengths and necklines on some of the other dresses. The first thing that impressed me upon receiving the dress was how fast the shipping was. I assumed since I had chose custom length, that it would take longer to get to me, but it got here in a week and was still the perfect length. The dress itself fits like a glove and is really well made, I'm considering keeping it on forever. It's really lovely on its own, so I didn't feel the need to go too crazy with the styling. Plus, it has pockets. Any dress with pockets has my seal of approval. What are you waiting for? Check it out yourself! Aw congratulations! I was so excited when they contacted me, too. This dress looks really great on you, I love that it's simple but unique! This dress is b-e-a-u-t-i-f-u-l and so flattering, too! I love the slightly vintage style and the three accent stripes on the bottom. You look lovely in it! This dress is SO amazing on you! You styled it so perfectly. I have only gotten one review product request too, and I was super jazzed when I got it! You're absolutely right about this place. Their dresses are adorable! It is a very cute retro-y dress. This is a very pretty dress and looks like it fits you wonderfully! I like the simplistic cut of the dress but with a twist at the top. Gorgeous! I know, free clothing was never the purpose behind my blog, but hey, it's a definite bonus! As a poor college student, it helps haha. Ahh, so this is the eShakti dress - I must say, you made a good choice! This dress fits you and your style perfectly. Isn't the custom fit just amazing? I love it! Haha, I was lazy too, but I chose the length so that it'd be right above my knee as well. cute outfit, the dress looks awesome on you! thank you so much for stopping by and for your sweet comment. 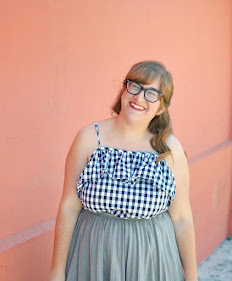 :) you have a lovely blog, and i especially like the striped hem of your dress...so pretty!! ah, the dress is so cute! i love the little gold details for the stripes. and congrats on getting to review! I LOVE IT! It looks like they nabbed a bunch of the FT girls to try things reading the comments, I am waiting for mine too! I seriously found my DREAM dress at eShakti but it was unfortunately sold out by the time I responded the next day. This one looks SO good on you, the unique cut is so perfect and looks both playful and classy! AHHH I want mine so badly now but had it shipped to Hawai'i! Maybe they knew we'd all be swapping! Also loving the tropical looking backdrop! That dress IS adorable and I'm excited that you've reached that blogger level of doing a review! How awesome!! I love this dress. I just received one from them too and I was heavily considering this one! I picked something way fancier and I love it too. This looks stunning on you! Like most things. I'm also in love with this setting. Take me there!